Everyone wants a shortcut, and consequently, that’s what everyone is selling. It’s what we’re selling ourselves, our friends, our families, and the world around us. It’s what we put out on social media, mixers, etc. It’s the story that we are selling, wherever we show up. I’m not immune to this. I want shortcuts to resolving the challenges I face with intimacy inside a relationship that is almost twenty years old. Rather than do the confronting and challenging work of rekindling the spark that once was and building a fire of desire with my wife, I want to find a metaphoric gas can, dump it on our relationship, set it alight and get straight to the good stuff. That would be a lot easier than being with the awkwardness of starting from the ground and building something that will last for years to come. 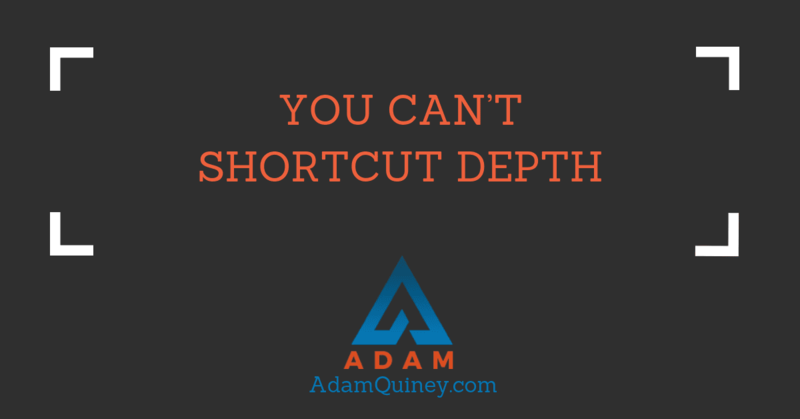 You know who tend to be most guilty of wanting shortcuts? People working with coaches (Coaches themselves are often the worst offenders). It’s in our nature. We’re playing this game of an exponential life, of pushing beyond what we think is possible, so we assume that means we shouldn’t have to slow down and walk the steps. We shouldn’t have to do the blue-collar work that the unconscious do. We shouldn’t have to do those things, because we’re better than that/worth more/above that/beyond that/etc. I can help you get there faster, but the way we do that is by supporting you to come to terms with where you are sooner. You can’t leave a place until you’ve actually been there, and so the sooner we can get you to come to terms with where you are right now, and what’s is next from here, the sooner you can move forward. So many people get stuck trying to avoid being where they are right now. You try to avoid feeling the sadness that is lodged deep in your heart. You create a life rooted in avoiding the terrible heartbreak that has been yours ever since that one event happened that ruptured you to the core. You try to build a life rooted in avoiding the intimacy that is your birthright, and then say things like “This is just the way I am” to explain the strategies you’ve had to create to succeed in life by avoiding your deepest truth. The shortcuts you, and pretty much all of us, want, are like stretching an already over-stretched rubber band even further. Hoping that you can achieve more if you just willpower or force your way forward with these same strategies, instead of slowing down and really taking stock of where you are and what’s going on in your life. We can help you get there faster, but you can’t skip steps.